August 19, 2014 By Elizabeth Lindemann 16 Comments / This post may contain affiliate links. Who doesn’t love a good baked potato? Deliciously simple, wicked easy to make, and super versatile topped with whatever fixings you want, they can be a really great, very inexpensive dinner on their own, or as a side dish with a delicious steak. Unless you are my husband, in which case, you don’t ever want baked potatoes. For some reason, Zach isn’t really a fan. I, however, LOVE them. And since he is off galavanting in the woods right now chaperoning a camping retreat for the seniors we teach, I’m jumping at the opportunity to make a baked potato for dinner. Yum yum yum. 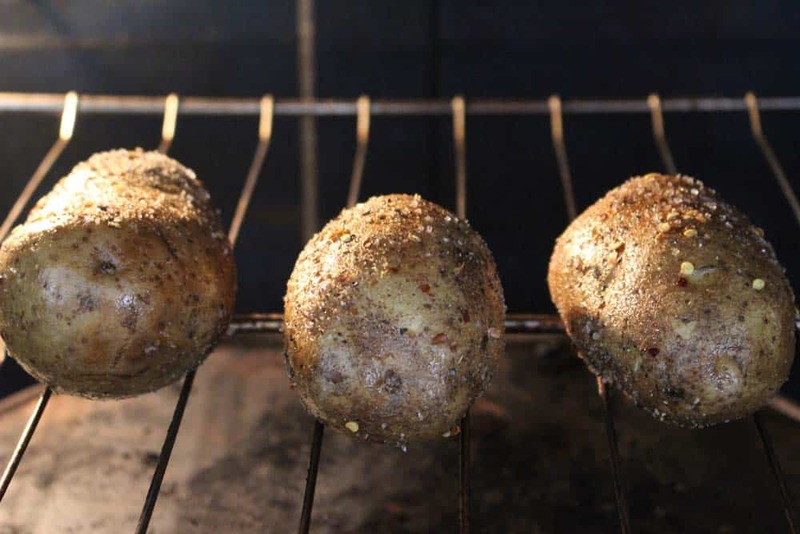 Here’s how to make perfect baked potatoes with yummy crispy skin, step by step. Next, you’ll want to use a vegetable brush to scrub the potatoes clean, since they can be pretty dirty. They do grow in dirt, after all. If you don’t have a vegetable brush, a clean towel will do. Then, pierce the potatoes with a fork a few times around the entire vegetable. This will allow steam to escape through the skin and proactively avoid a potato explosion in your oven. Now, rub the potatoes all over with olive oil. Coincidentally, olive oil is an awesome natural skin moisturizer. If you aren’t weirded out by this, rub the residual olive oil on your hands into your hands and arms before rinsing it off and you’ll have silky smooth skin! Season all sides of the potato liberally with salt, pepper, and crushed red pepper (if you like things spicy). I will usually lay the potatoes on a cutting board, season the side facing up, and turn the potato 90 degrees to season again, repeating until I am finished. Remove from the oven and allow to cool for at least five minutes. Slice the skin on top across lengthwise with a sharp knife, cutting about a half an inch through. Then, squeeze on either end of the potato pushing in toward the center. This will make the cut open up and allow access to the inside of the potato without compromising the skin’s structural integrity. Fluff the insides with a fork and, viola! 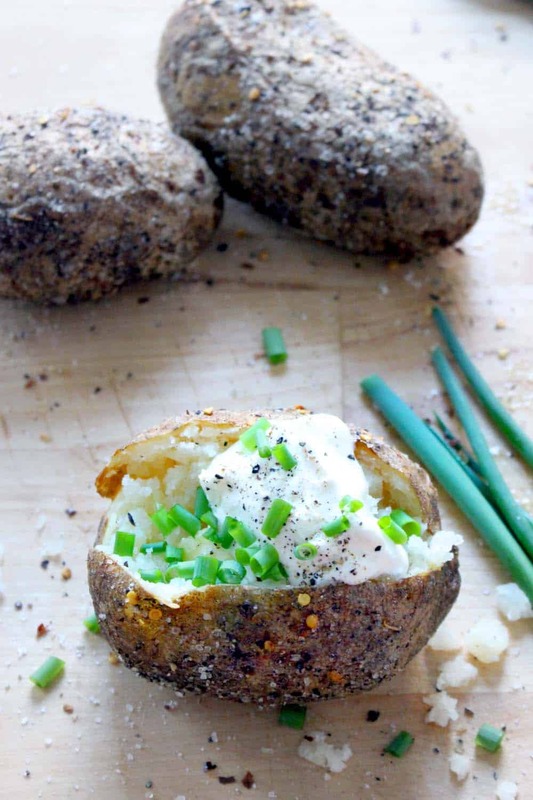 You have the perfect baked potato! NOW FOR THE FIXINGS!!!! Sorry to yell, I just get really excited about this part. 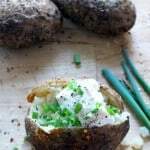 I usually go traditional: sour cream, butter, salt, pepper, and green onions. Sometimes I add crumbled bacon and/or cheddar cheese, if I’m feeling crazy. 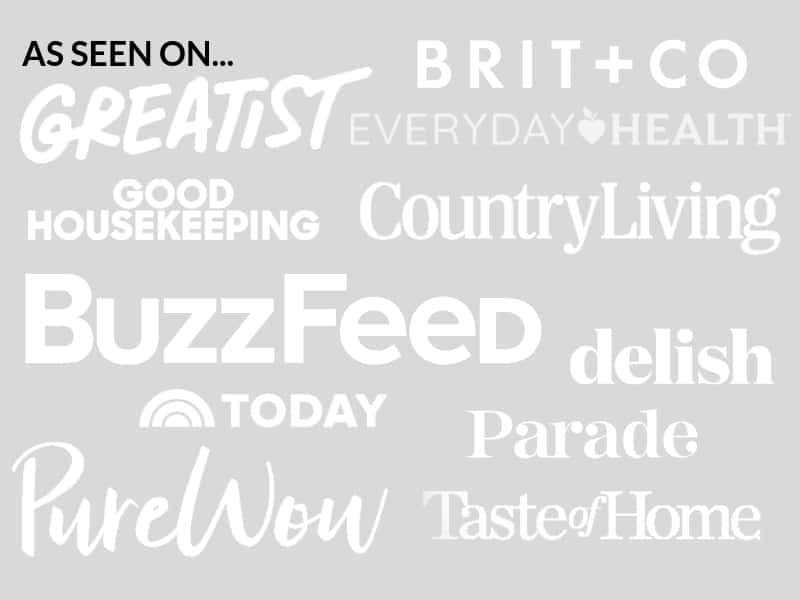 OR, you can try something from this awesome list of 23 Amazing Ways to Eat a Baked Potato from buzzfeed. I will definitely be trying #21 with my smoky vegetarian chili sometime in the very near future. 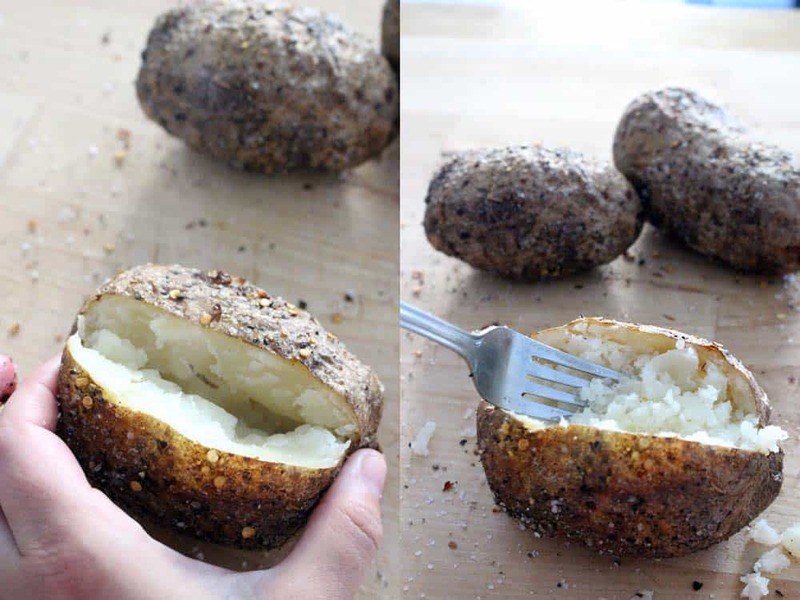 Baked potatoes are cheap, wicked easy, and SUPER tasty, especially if you make the skin crispy and delicious using this method! Makes a great dinner on their own or a side for a bigger meal. Fixings sour cream, butter, scallions, bacon, cheese, etc. 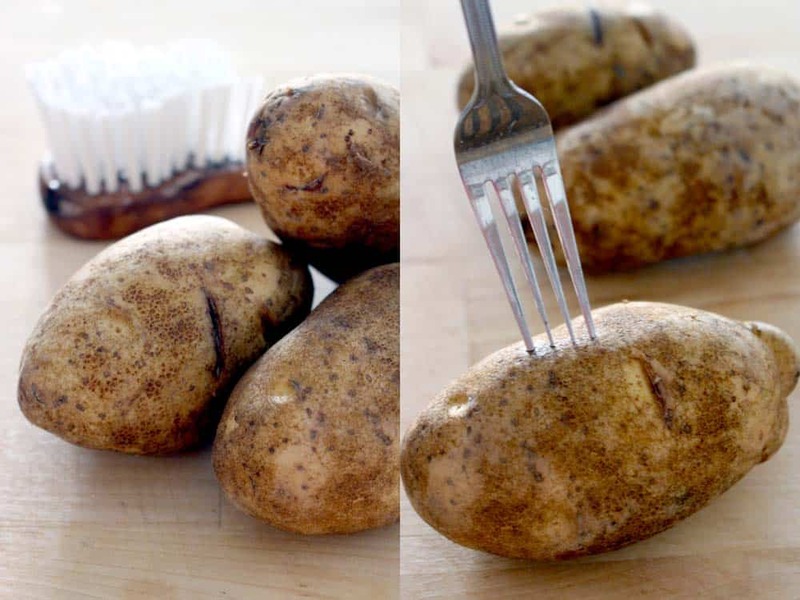 Clean potatoes well with water and a vegetable brush or clean towel. Dry. Pierce potatoes with a fork a few times to allow steam to escape. 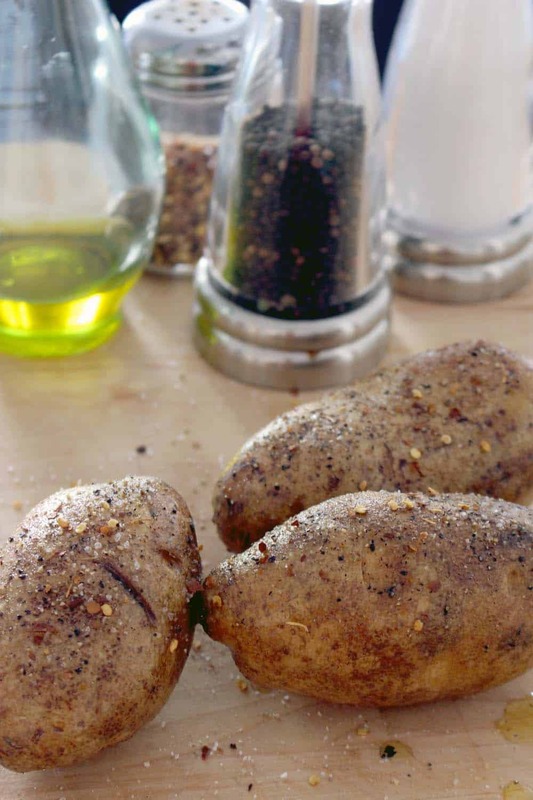 Rub potatoes with olive oil and season all sides with salt, pepper, and crushed red pepper. Place potatoes directly on rack in oven with a roasting pan or baking sheet underneath, to catch drippings. Bake for 45 minutes to an hour, or until fork-tender. Remove from oven and allow to cool for at least 5 minutes. Using a sharp knife, slice the skin lengthwise on top. Squeeze the sides of the potatoes to open up. Fluff the insides with a fork, and top with fixings. Wow, this is one of the best comments I’ve received in a long time!! I’m so happy you and your husband liked these baked potatoes, and glad I may have converted you :-) Thanks so much! Thank you so much for the feed back. ???? Mine didn’t get crispy. ???? Aw, what a bummer! Next time, maybe try at 425 instead of 400, and if they aren’t looking crispy toward the end, run the broiler for just a couple of minutes on each side. That should do the trick. Hope that helps! Best baked potato I have ever had! I followed the ingredient list and recipe instructions exactly and I will never wrap a potato in foil again! Can I use red skinned potatoes for this recipe? These are amazing! 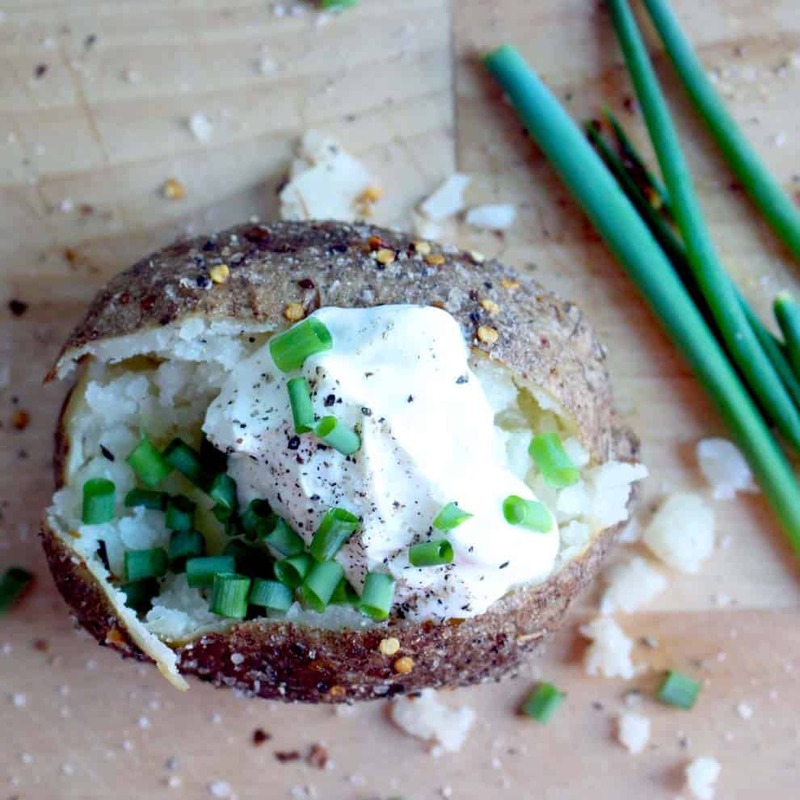 I always struggled to make crunchy skin baked potatoes without crisco like my mom uses. Every time I follow ALL your instructions they turn out amazing with perfect flavor. I’m not sure why it works but thanks so much! These look delicious to me, and I was waiting for you to mention that my son does not like bake potatoes. Honestly, we do not know where he gets that from. Who doesn’t like a dressed-up bake potato?!! YUM! I like the skin on the potato, too! Again, YUM! Must be a recessive gene. :) Enjoy your baked potato, and I know Zach is missing you, too.